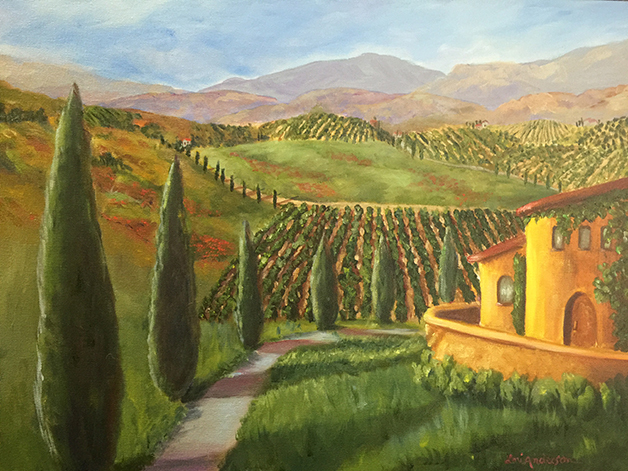 Lori Anderson is one of the founding members of the Sutter Street Artist Gallery, as well as the president of the Folsom Arts Association (FAA). Having grown leaps and bounds over the years—currently, there are over 170 members—the FAA is a valuable resource to both artists and the community alike. Leadership roles aside, Anderson chooses to work mainly in oils—due to their fluid movement and blendability—creating both resolute, realistic wildlife and florals, as well as reflective abstracts. Her work can be viewed at Folsom’s Willow Café & Sweetery, the Gold Country Artists’ Gallery in Placerville, the Sutter Street Artist Gallery inside the Bag Lady Boutique on Sutter Street. HLB: What motivated you to paint? LA: A trip to Italy in late 2001. Going through my photos after the trip, I felt that I wanted to paint one. I had some bottles of stencil paint, bought a little canvas board and did my painting. I loved it. [The following year] I retired and had so many projects on my to-do list. I cleaned the garage, and then I took a painting class through Folsom Parks and Recreation. The rest of my projects are still waiting for me—it might be a long time. HLB: Were you artistic as a child? LA: I find inspiration everywhere. I see something that appeals to me, and I feel a need to paint. I love painting animals, still life and florals. I don’t do many landscapes—mainly because there are so many landscape painters that do such beautiful work, and I want to make my focus different. HLB: What advice do you have for overcoming artist’s block? LA: If you’re having artist’s block, go to an FAA meeting and find some inspiration. If you still aren’t feeling it, find a photo you like, go to your easel and start painting; sometimes the hardest part is getting started—the inspiration will come. HLB: Why are art organizations vital? LA: I’ve asked painters why they aren’t members of FAA and many have said, “I’m not good enough to be a member.” Our main objective is to help members learn about and experience all different kinds of art and to keep them from learning things “the hard and expensive way.” This is one way to become a better artist. HLB: Why do you call Folsom home? LA: There’s hardly anything I don’t love about it. For the first time in my life, I feel that I’m home. I love the way Folsom is bordered by Highway 50, the river and El Dorado Hills. It’s not sprawling the way other places are. Anyplace you go, you’ll see someone you know, and we have everything we need—great restaurants and shops, the beautiful Palladio and [historic Sutter Street]. Photos by Dante Fontana. Art images courtesy of the artist.